Overview - Ensyn - Renewable Fuels and Chemicals from Non-Food Biomass. Ensyn’s patented RTP® technology is a commercial thermal conversion process that produces high yields of valuable biocrude from renewable cellulosic biomass, typically wood-derived feedstocks. 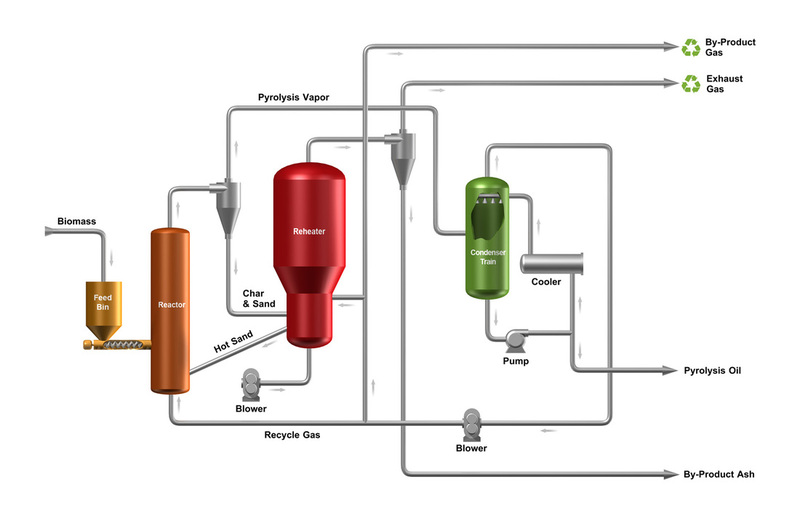 The biocrude is used directly as a renewable fuel oil (RFO) for heating and cooling purposes, as a refinery feedstock to produce renewable ‘drop-in’ gasoline and diesel, and as a chemical feedstock to produce food flavorings and fragrances. Liquid biocrude yields are typically 70 to 75 wt% from dried wood residues. Byproduct combustible gas and char make up the balance and are used as an energy source to run the plant and dry the biomass feed material. Ensyn's RTP process is the leading technology, worldwide, for the commercial production of liquids from wood biomass using fast thermal conversion. Ensyn’s RTP technology is supported by a portfolio of patents on a variety of significant aspects of the process. Ensyn’s patent strategy aligns with Ensyn’s business focus on continuous development. As innovations and improvements emerge, new patents are filed. Ensyn’s current patent portfolio consists of 17 patents granted and 18 patent applications pending in the U.S. and 18 patents granted and 79 patent applications pending outside of the U.S.